Inder Loves Folk Art: Crouton's really done it this time. Yes. That's the Holy Bible, post Crouton. Huge sections of it are now missing - presumably because they ended up in Crouton's GI tract (Steve says, "He has really digested God's word."). Namely, the first five books of the Hebrew Bible (the Law) as well as Revelation. 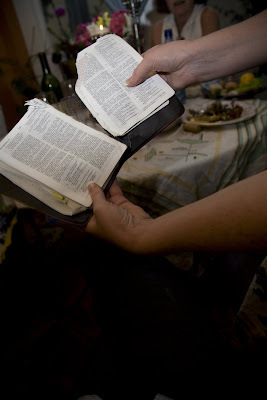 I'm pretty sure that Leviticus forbids allowing your dog to eat your Bible (very unkosher! ), but I can't say for sure, since he ate that book.